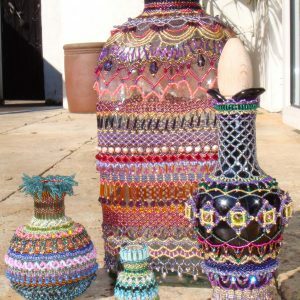 This is the opportunity for you to push the boundaries of your beading knowledge to the max, because beading bottles is a fabulous, fun way of using every stitch in the book and some! 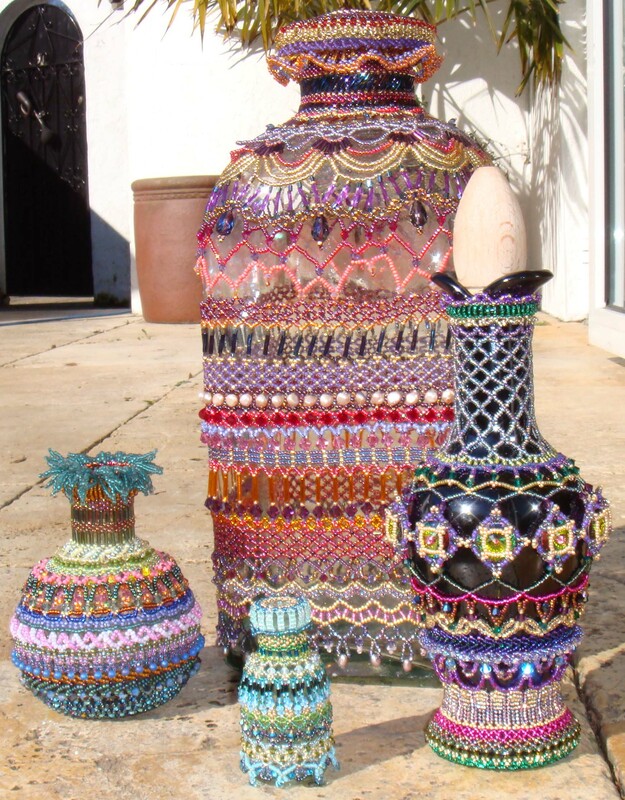 As no two bottles will be the same, they will dictate the bead numbers and sizes you choose to work with, so every beaded row and every finished bottle will be totally unique – a masterpiece! The pattern gives you guidance on how to calculate the bead numbers needed to tailor your beadwork to your own bottle, also about transitions from one stitch to another. Plus, there are colour images to help give you ideas and inspiration. 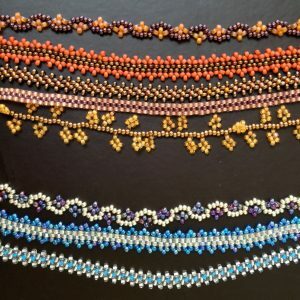 Techniques used: It will be helpful if you have experience working in as many beadwork stitches as possible, including Peyote, Herringbone (Ndebele), Netting, Albion, Square Stitch, St Petersburg chain, fringework, bezeling, daisy chains and other beaded braids. 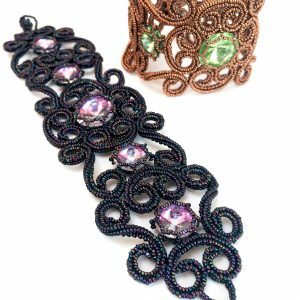 The Beaded Friendship Bracelet is a great starter project for beginners - the perfect way to play with colours, get to know three beaded braids and how to make a feature of the attachment to the clasp. You'll want to make them in many different colours Techniques used: 1-Stitch Peyote, Picots, Netting, Right Angle Weave, Ladder Stitch. Think iron gates, church railings and stained glass windows, and maybe something a little French in there too! Lacy swirls, scrolls and curlicues surround beautiful, delicately bezelled crystals and lightly encircle your wrist. The Beatrice Cuff closes neatly with an innovative, incredibly secure clasp. 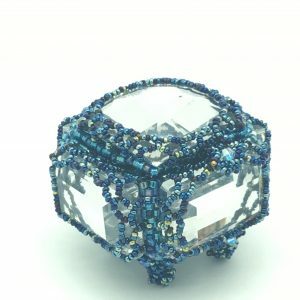 Explore ‘bead engineering’ with this beaded bracelet kit; the tubular Herringbone framework is solid, providing stability to the entire cuff and crystal settings. As you work the different elements you'll see that there’s plenty of scope to use them separately or together in further designs. Bead colours may vary slightly, according to availability. Kit Contents: 18mm Swarovski Rivoli #1122 - Peridot 14mm Swarovski Rivolis #1122 - Peridot Size 15° Miyuki Seed Beads – #457 Bronze or #457L Light Bronze Size 15° Czech Charlotte Seed Beads – Bronze or Light Bronze 6mm Swarovski Briolette #5040 - Peridot Techniques used: Tubular Herringbone, Modified Brick Stitch, Ladder Stitch, Square Stitch Skill Level: Intermediate to advanced. Tools you will need: I recommend using 4lb Fireline in all my kits. Anything bigger will not work with the tiny Charlottes. You will also need size 13 and 15 needles. Think iron gates, church railings and stained glass windows, and maybe something a little French in there too! 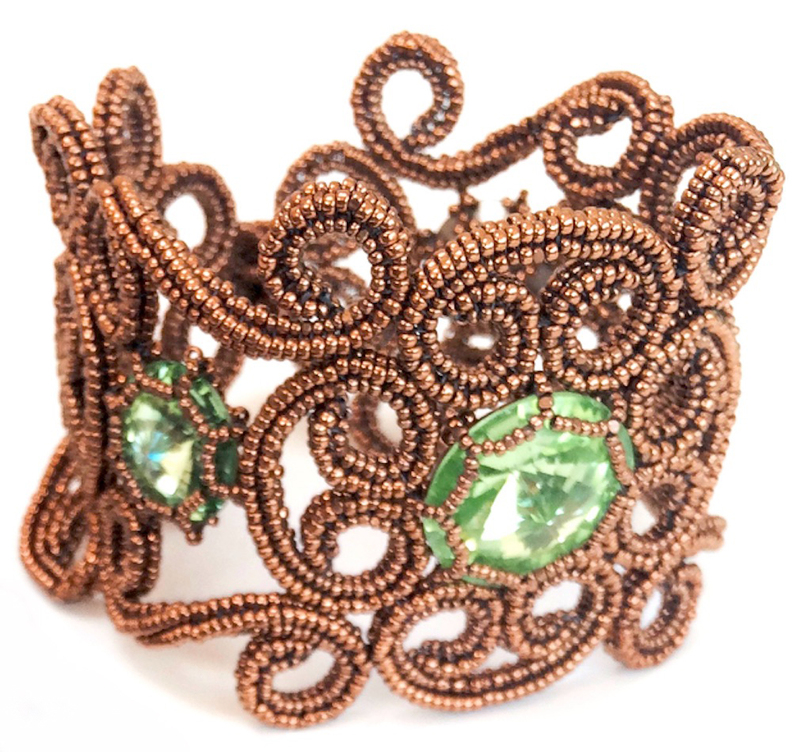 Lacy swirls, scrolls and curlicues surround beautiful, delicately bezelled crystals and lightly encircle your wrist. The Beatrice Cuff closes neatly with an innovative, incredibly secure clasp. 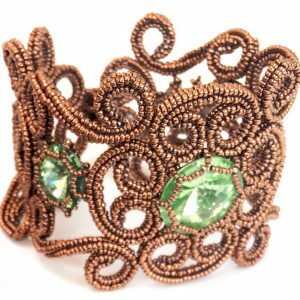 Explore ‘bead engineering’ with this beaded bracelet kit; the tubular Herringbone framework is solid, providing stability to the entire cuff and crystal settings. As you work the different elements you'll see that there’s plenty of scope to use them separately or together in further designs. Kit Contents: 18mm Swarovski Rivoli #1122 - Vitrail Light 14mm Swarovski Rivolis #1122 - Vitrail Light Size 15° Miyuki Seed Beads – #454 Purple Iris Size 15° Czech Charlotte Seed Beads – Purple Iris 6mm Swarovski Briolette #5040 - Cyclamen Opal Techniques used: Tubular Herringbone, Modified Brick Stitch, Ladder Stitch, Square Stitch Skill Level: Intermediate to advanced. Tools you will need: I recommend using 4lb Fireline in all my kits. Anything bigger will not work with the tiny Charlottes. You will also need size 13 and 15 needles. 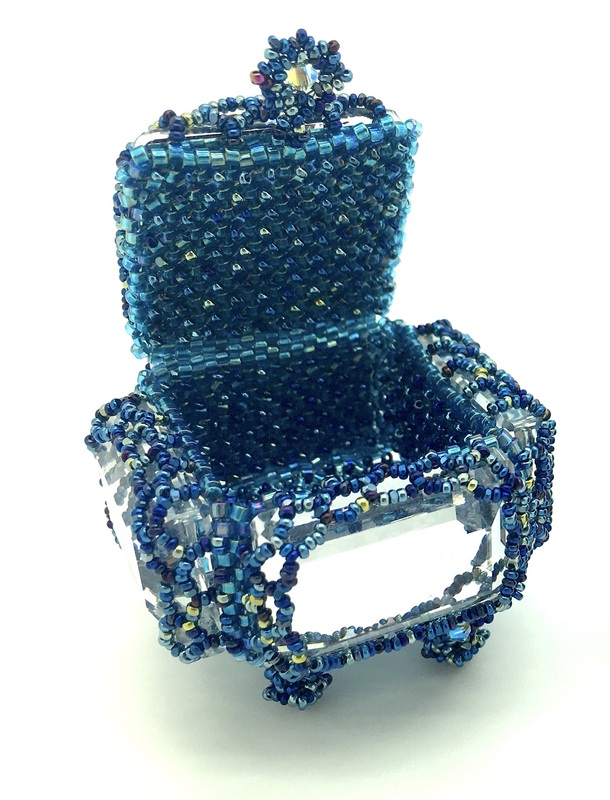 Standing on four delicate bejewelled feet, this dainty little jewellery box displays beautiful crystals trapped in filigree beadwork on each facet, including the lid, and the internal walls are reinforced with tiny beads like the nails in a true treasure chest. 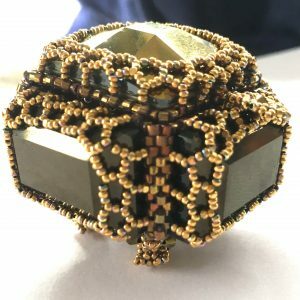 Constructed from its component pieces, this is a real heirloom piece, but the exciting thing is that the components and techniques can also be used to create equally stunning, standalone pieces or incorporate them into your own creations. 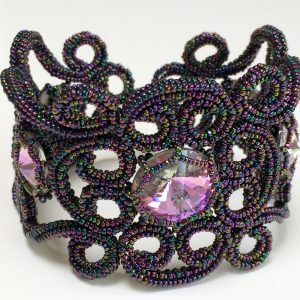 Mix Herringbone, Peyote, Right Angle Weave and Square Stitch together in your beadwork, sometimes all within one row, and you’ll produce some stunning sculptural effects as well as have a lot of fun. It’s a bit like doodling three-dimensionally. I just love those “what if....” moments when I’m experimenting and mixing stitches and the Byzantine Cross incorporates all of this. The Byzantine Cross is made from a few different components, worked together to produce a three-dimensional, reversible piece. 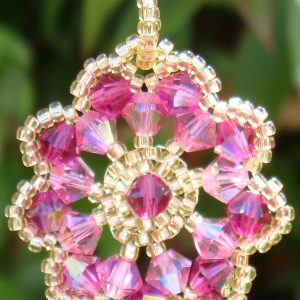 If you want to challenge yourself and boost your beading techniques, this is it! 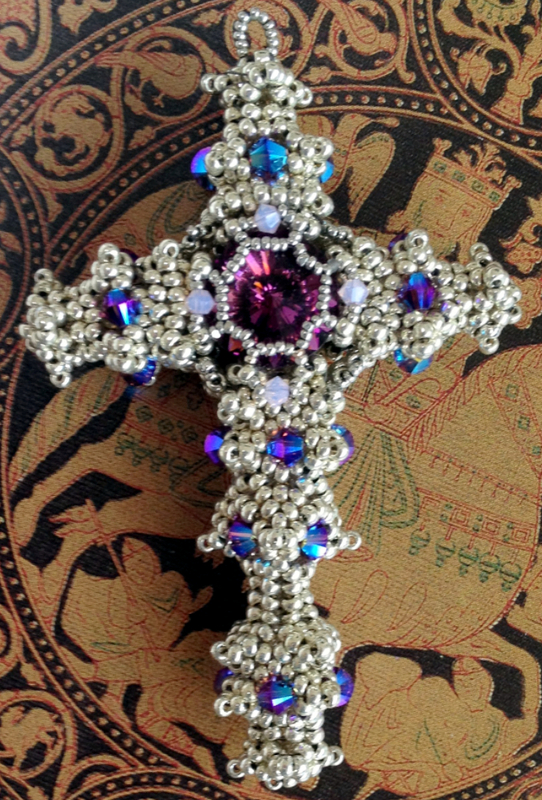 Add a loop to the top sector of the cross, add a chain and make it into a fabulous pendant. But don't stop there, the instructions extend to different bead sizes so you can make the cross in other colours and sizes - why not make three - size 8°, size 11° and size 15°, and wear them all at the same time on different length chains! Techniques used: Tubular Peyote, Organised Freeform Peyote, Freeform Herringbone, RAW and Square stitch - it's all in the pattern! 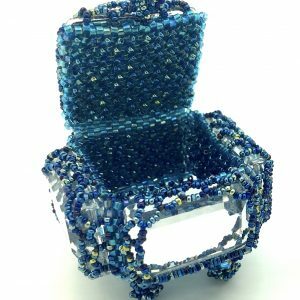 Mix Herringbone, Peyote and Square Stitch together in your beadwork, sometimes all within one row, and you’ll produce some stunning sculptural effects as well as have a lot of fun. It’s a bit like doodling three-dimensionally. I just love those “what if....” moments when I’m experimenting and mixing stitches and the Byzantine Cross incorporates all of this. The Byzantine Cross is made from a few different components, worked together to produce a three-dimensional, reversible piece. 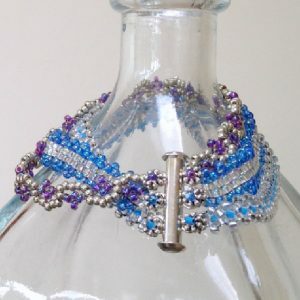 If you want to challenge yourself and boost your beading techniques, this is it! 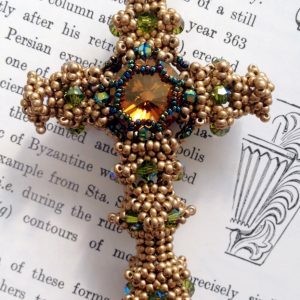 Add a loop to the top sector of the cross, add a chain and make it into a fabulous pendant. 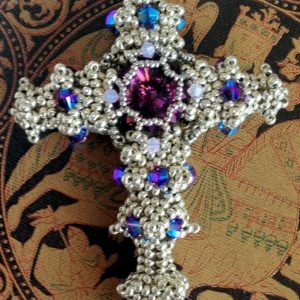 But don't stop there, the instructions extend to different bead sizes so you can make the cross in other colours and sizes - why not make three - size 8°, size 11° and size 15°, and wear them all at the same time on different length chains! 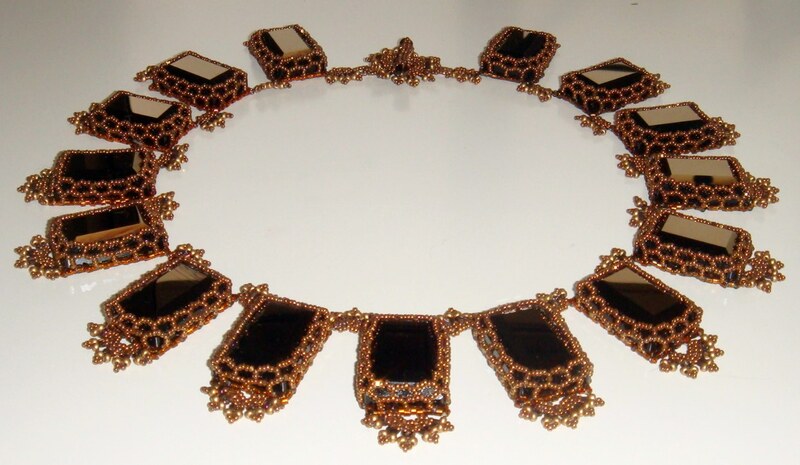 The Caterina Necklace is a real showstopping display of fabulous crystals each set in delicate filigree beadwork. The stunning Swarovski Step Cut Fancy Stones (#4582, 24x16mm) used in this piece are deliciously grand and really make a bold statement, but they are rare and have been discontinued, so make sure you can source them first. 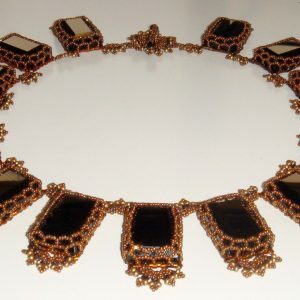 The necklace displayed incorporates 15 stones, but not everyone wants to make such an opulent piece, so you could make a version with 1, 3, 5 or 7 stones etc. and finish with a rope of your choice. Techniques used: Some experience needed in RAW, Peyote stitch, Herringbone and Brick stitch. 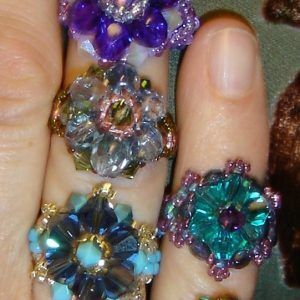 These rings are quick, easy and fun to make, with lots of potential for adaptations, plus they are a great way of using up odd crystals and seed beads. 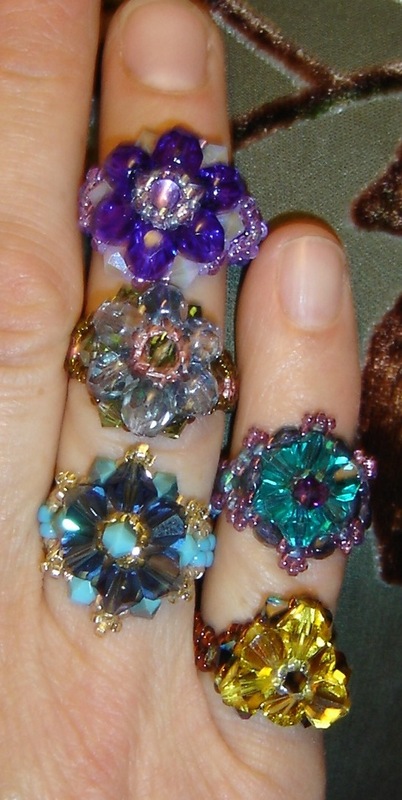 Make lots in different colours to suit your mood or outfit and they make perfect little gifts for friends. 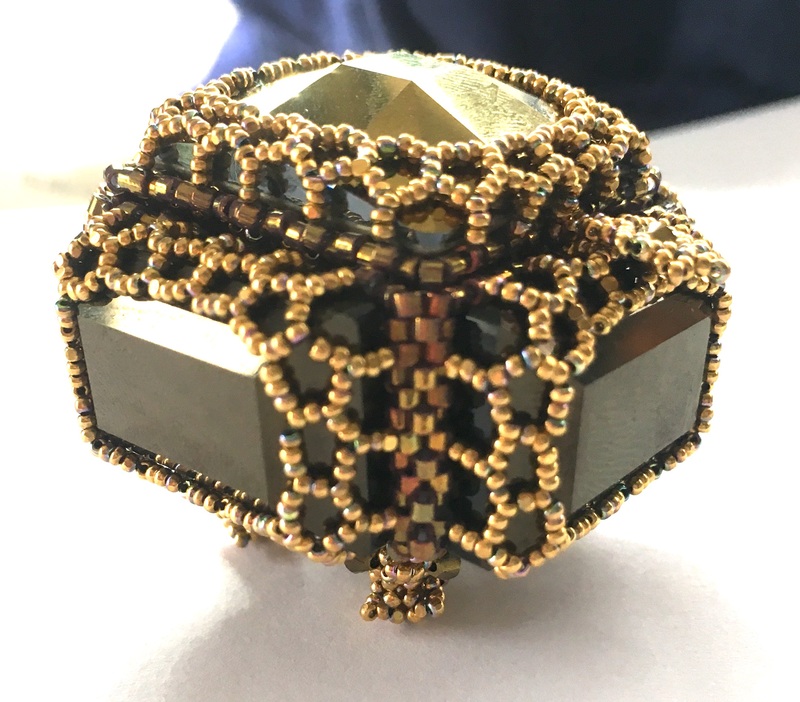 The prominent stitch in this pattern is RAW, working in circular RAW for the ring face, using large and small beads for each stitch, and linear RAW for the ring itself. There are suggestions at the end for further adaptations and embellishments. Techniques used: Right Angle Weave. 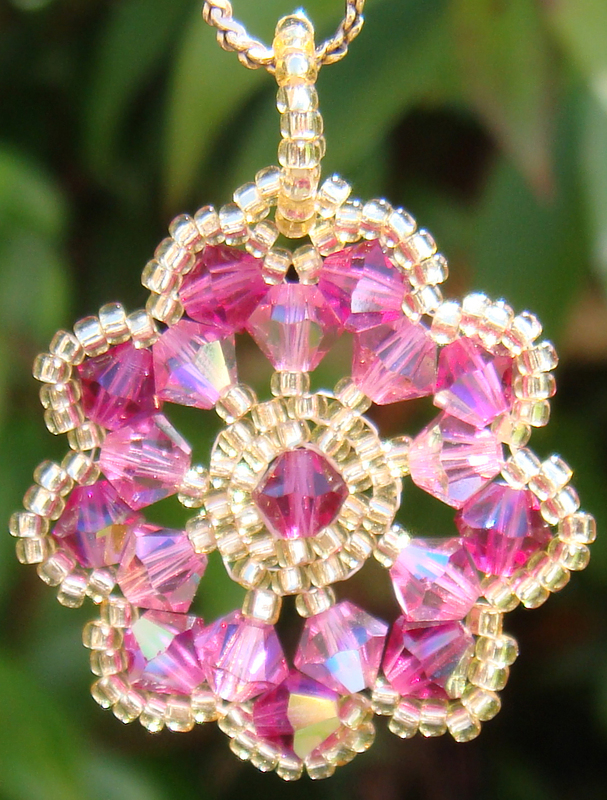 The rosette pendant is petite and delicate. Made almost entirely in brick stitch, this simple, but effective pattern is quick and easy to make, so it’s ideal as a gift for someone, and it’s a great way of using up odd beads and crystals. The subtle effect brought about by using two shades of one colour is very pleasing to the eye; the colour of the dark outer crystals seems to graduate towards the lighter, inner crystals and fade in the open latticework inside the structure. Techniques used: Brick Stitch, Netting.